Over the weekend I went through the photographs I had stored on my desktop computer and found several that I haven't shared here on my blog. As you all know, I love city life. Ever since I was a young kid, I always knew that I wanted to live in a city. I truly appreciate the rural, countryside because I thoroughly enjoy spending time closer to nature. However, to live, I thrive within a city environment. It's almost as if city life is a part of my DNA. It's something I feel deeply connected to, as if I truly belong. 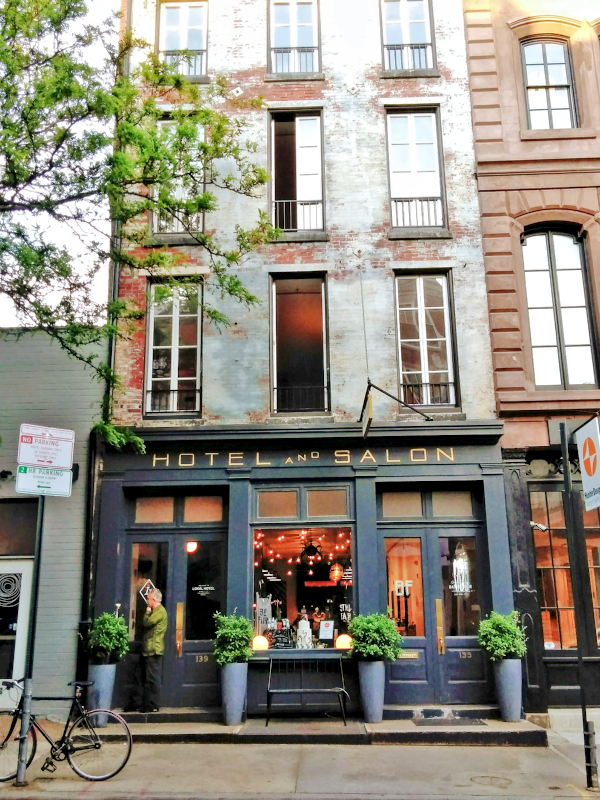 The thing I love most about city living, especially the cities here on the East Coast, is the diversity in how they look - a mixture of old and modern; beauty and grittiness; and a non-perfection, that to me, I view as perfection. 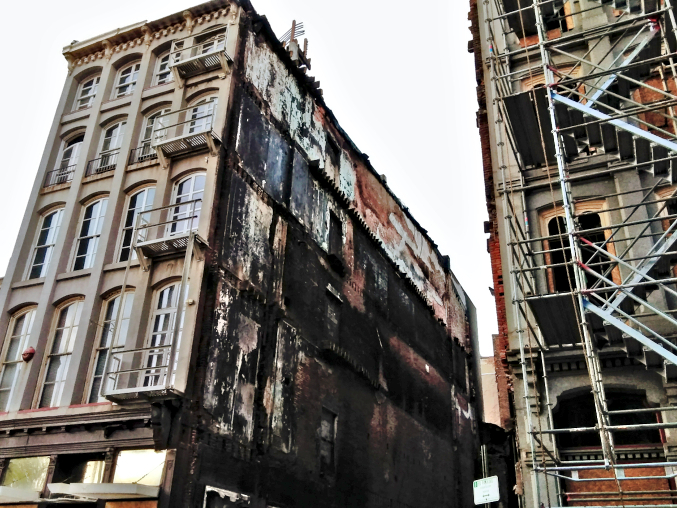 Last year a fire broke out in the middle of the night in the basement of a restaurant in Old City, which was between these two buildings. Luckily, no one died or was even hurt. 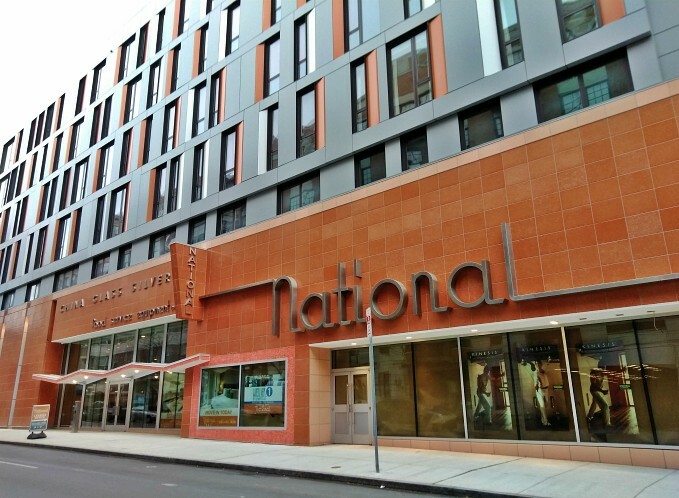 For many, many years this was The National Restaurant Supply Store, which has recently been converted into a luxury condominium. I love how they kept the name and the original art deco exterior. I love the windows and exterior of this apartment building. Faaaaaaaaaaaaabulous! Have a terrific week, y'all! What wonderful shots! You can find so many amazing things to catch the eye in a city... I love that huge mural and that Chanel bag art! 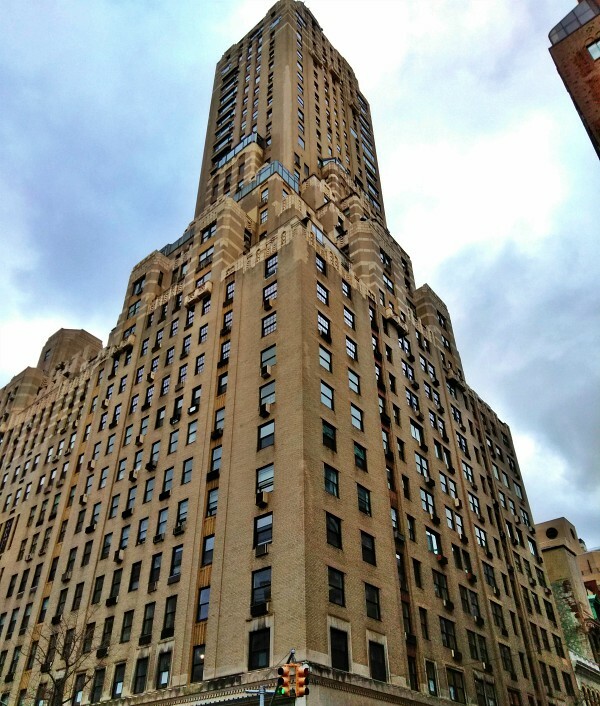 The Carlisle Hotel is most definitely a landmark building. I like the last building as well. To me, it has a comfortable look about it, and not too high! I can understand your love of everything in NY, and I still think of it with affection. Hope your snow has gone. It is a beautifully sunny morning here but COLD. Weather forecasters can't make up their minds about snow in my area. Hey Ho! Have a nice day. I love seeing the different architectural styles. I often find myself wondering about the people that lived in older buildings that are past their prime now. I simply LOVE the first shot of the painter! Brilliant! While modern buildings have a beauty of their own, in my opinion, they simply don't stack up to the beautiful details of the past. I'm so glad you found these shots hiding on your computer and decided to share them here -- they're really quite GOOD, you know! I love the front doors of The Times and looking up at all those immense skyscrapers. My little town doesn't have buildings tall like that. I suppose when we were settled, there was so much land available that buildings went wide instead of high! I'm not a big fan of outside fire escape stairs like those in your last photo. I can appreciate the need to have them, but coming down and seeing what's below through those slats kind of makes me dizzy!! You know, I've never lived in a city, Ron. It's always been the suburbs (or Air Force bases). I went through a period where I wanted to experience the excitement of living in the heart of downtown, a place that was in easy walking distance of restaurants, bars, and shops, but it just never happened for me. And it sure isn't going to happen in Rapid City, lol! But now my dream is a home in the country, so I'll just live vicariously through your photos. Speaking of, my fave is the Business district on Market Street shot. 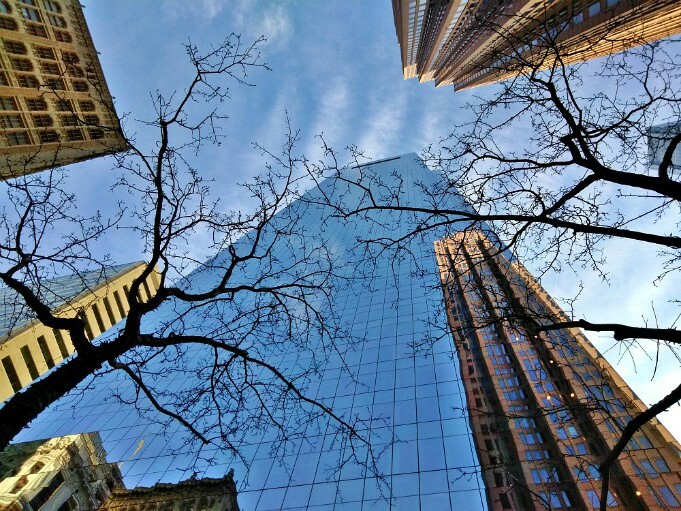 Love the angle and the juxtaposition of tree branches and gleaming glass skyscrapers. 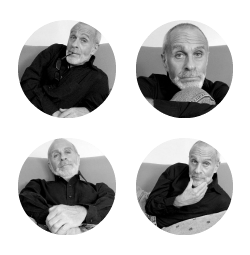 Ron, I love these photos! That first one of the guy painted on the the wall painting is so cool! I too love living in a city. I knew city life was for me the first time I ever visited. I would really like to live in New York City one day, just to see what it would be like. How long did you live there? Thank you, Fiona :) Isn't the mural so cleverly done? 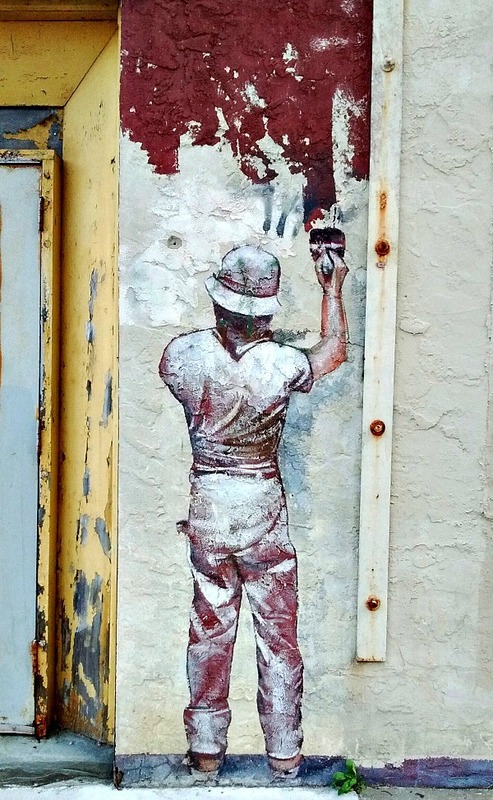 It was painted many years ago and is still there. LOVE the Chanel bag art too! I used to work for Chanel, so I love anything with those interlocked CC's! Thanks so much for stopping by my friend. Have a fantastic week! OMG Valerie, you would LOVE The Carlyle Hotel because it's such a classy hotel, filled with so much history of the many people who have stayed there. Lady Diana had a regular room there whenever she was in New York. As well as, Prince William and Kate Middleton. In case you're interested, I am leaving you a link of a trailer about about The Carlyle, which I saw last year. It's SUCH a wonderful documentary. If you like it, see if you can find the whole documentary online in the UK. I think you'll love it. Isn't that such a COOL-LOOKING building? Ha!! Yes...it does look like a city bus terminal!!! They just recently finished the reconstruction on it. It's located in a very expensive part of the city, so I can only imagine the pricing!
" the bike and the man in the green sweater. " Thank you :) I took that photograph last summer, but never posted it. I love that building because of the distressed paint on the outside. And I think the whole building so cool because it's got such a cool vibe. Me too, aren't the diverse architecture styles so interesting? That's what I love about the cities here in the North East, the styles are so varied. 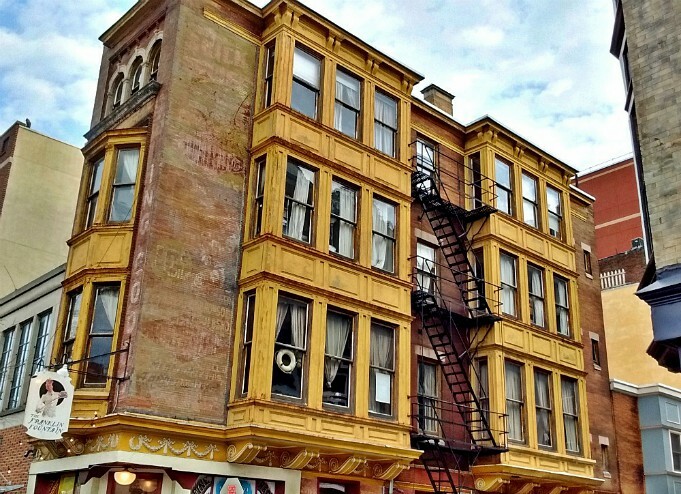 "I often find myself wondering about the people that lived in older buildings that are past their prime now. " Yes! I do the same thing. In fact, the apartment building I live in was built in 1930. It was originally a hotel, so I often wonder how many different people stayed in my studio apartment. The building still has all the old wooden floors, molding, and glass door knobs. Isn't that mural of the painter faaaaaaaaabulous? I don't know who painted that, but whoever it was, did a great job!
" While modern buildings have a beauty of their own, in my opinion, they simply don't stack up to the beautiful details of the past." Thank you, Debbie :) I needed to clear some space on my computer because of all the pics I upload. I also keep many of them on a cloud. 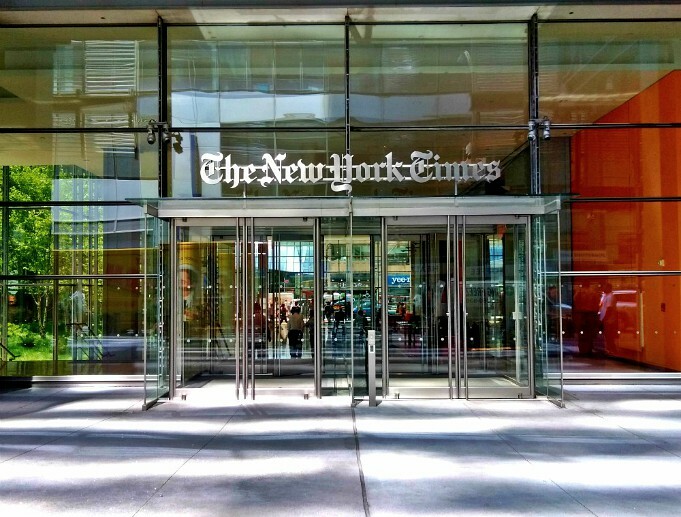 I took that photograph of The New York Times last summer on one of my day trips. It's very close to restaurant I like to eat whenever I go there. "My little town doesn't have buildings tall like that. I suppose when we were settled, there was so much land available that buildings went wide instead of high!" Yes, I bet you're right about that. 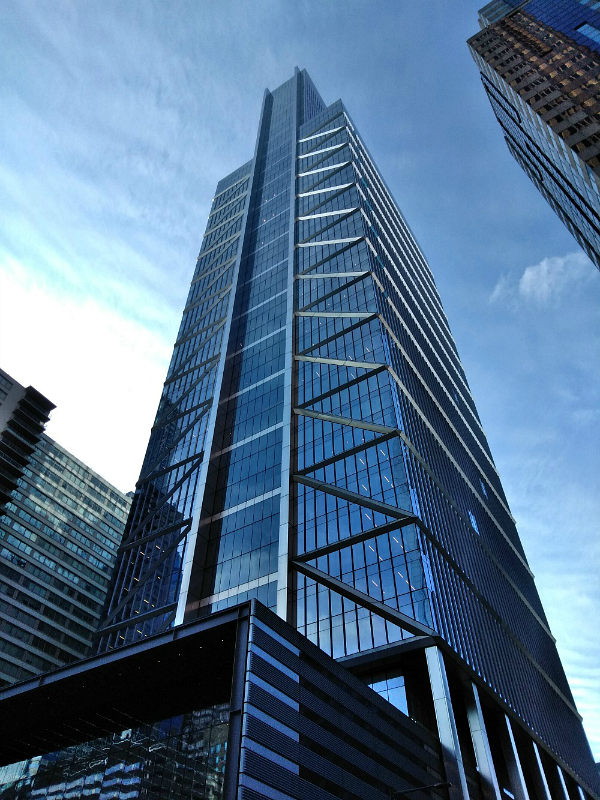 It's funny because people say the buildings here in Phillly are tall, but from all my traveling and living in NYC, the buildings there are INSANE tall. I remember visiting the World Trade Center before it came down. The view from the top was mind-blowing.
" I went through a period where I wanted to experience the excitement of living in the heart of downtown, a place that was in easy walking distance of restaurants, bars, and shops, but it just never happened for me. And it sure isn't going to happen in Rapid City, lol!" Mark, where you are living now is PERFECT for you! I can tell from your blog posts and Instagram feed how much you're enjoying life in South Dakota. I'm so happy for you! Yet, I could so see you in a city environment (even to just visit) because you have lots of energy (like me), so I think you would fit in very well and adapt to the pace of a city. One day I'm hoping to meet you and Tara in New York! Thanks so much for stopping by, my friend. Have a most fabulous week! Thank you :) I don't know who painted that, but every time I walk by it, I smile. If you enjoy living in a city, you have got to try (at least visit) New York. It's truly my favorite city on the East Coast. I freaking LOVE it! I lived there for six years (from 1974 to 1980). One day I hope to live there again. what's up, ron. absolutely love the first photo. it's beautiful. just the right amount of everything! hope you are well, we have to catch up for real! Thank you for the link. I enjoyed seeing the inside of the hotel. Hey there Val....great to see ya! Thank you :) I had these pics (and many others) stashed away on my computer and needed to clean them out to make space. I also have some stored on my photo cloud. Yes, let's do New York. Perhaps in the Spring. Thanks so much for stopping by. Have a fab week! As always, Ron, your photographs ROCK! I really like the one of the painter and Market Street. I love the angle you shot that one, and how the tree branches cover the building. You have such a great eye! City life is so you because of the way you speak of it and the passion of your photographs. Aw, thank you, Matt :) The more I practice photography, the more my eye becomes more aware of my surroundings and how I see things. I've always been attracted to cameras, photography and photographs, and how the capture moments. I'm not really a city person myself, but I always love your gorgeous city posts. And actually, I do like to visit cities, but my heart longs to live somewhere remote. The third to last photo reminds me a little of Havana. And I really like the one of the wintry trees against the blue glass building. Ron, your wonderful shot of The Carlyle Hotel reminded me of a time when my husband and I had dinner with a business associate and his wife back in the 90s. They or course paid for everything or we could have never afforded it. The whole evening was amazing! Being a New Yorker, I knew of the hotel but had never thought I would ever go there. It was like stepping back in time because it's such an old, classic landmark. Did you know that Jackie Kennedy used to go there quite frequently? That hotel has so much celebrity history. All these photos are super! I love the painter and the Chanel widow display. I love city life as well. And although I lived on Long Island when I was still in NY, I always longed for city life. OMG Elaine, you actually HAD DINNER AT THE CARLYLE?!?! I bet the experience was phenomenal! Back in November on one of my trips into NYC, I stopped by the hotel and took some photographs of the exterior. I did go inside briefly and snoop around the lobby area and LOVED it. The whole time I lived in the city, I never even knew about The Carlyle.DUH! And what's funny is that my apartment was on 65th street between 5th and Madison, and the Carlyle is on 76th and Madison, which was not that far away. I watch a documentary (Always at The Carlyle) last year and LOVED it! And that's when I first found out about it. YES!!! That hotel was/is a haven for celebrities. And yes, they mentioned something in the documentary about Jackie Kennedy eating in the restaurant a lot. Often for lunch. Here is the link to the trailer for the movie, it's awesome! Yes, many people feel as you do. My brother loves to visit Philadelphia and New York, but could never live in a city. It's one of those things that you instantly feel about city living, like I did when I was a kid, I instantly knew I had to live in a city. But it's definitely not for everyone. "The third to last photo reminds me a little of Havana." OMG, you're so right...it DOES! I've never been to Havana, but all the photographs I've ever seen look very similar. I love how Cuba still has that "vintage" feel, with the 1950's automobiles and Spanish architecture. It's stunning! Thanks so much for stopping by, my Libra friend. Have a fantastic rest of your week! Great photos, Ron--as always! I love how the National Restaurant Supply Store's exterior was preserved. These old buildings have a lot of life in them since they were built by true professionals using solid materials. They may have some mileage on them, but that just makes them more interesting! "These old buildings have a lot of life in them since they were built by true professionals using solid materials. They may have some mileage on them, but that just makes them more interesting!" Yes, my sentiments, exactly! 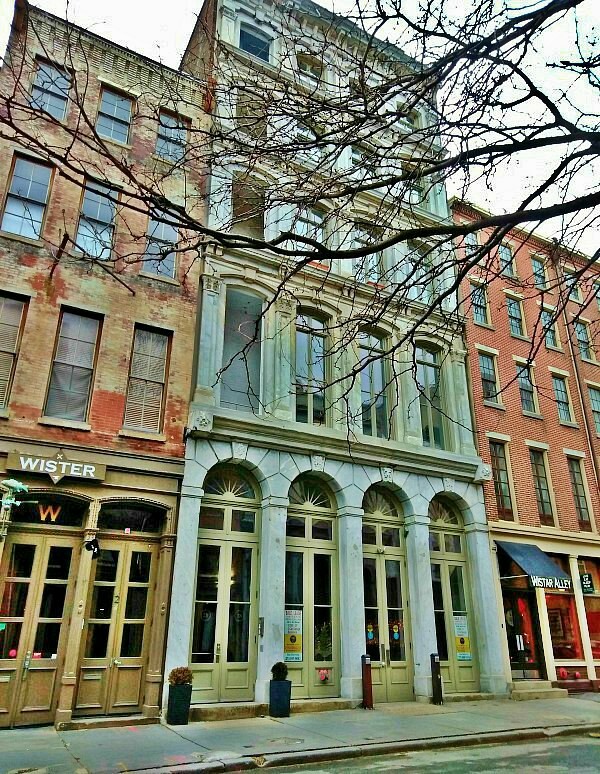 And That's one of the main things I love about the cities on the East Coast, we have some of the most beautiful and worth-preserving architecture in the US. Thanks so much for stopping by, buddy. Hope you're enjoying your weekend!